Morocco's colourful, pungent and frenetic centres are the perfect opposite to the vast expanses of pale, mystical desert and the rugged ridge of the Atlas Mountains. The main cities, built around their incredible marketplaces, have been hosting visitors for centuries, first on the great trade routes, then in thrall to the exoticism of the east, and of Africa. There's so much to experience here, from assailing great mountains, to parasailing and learning to roll cous cous to learning to haggle for rolls of rugs. But whatever you do you'll need somewhere to relax at the end of the day, and the best places to stay in Morocco all offer that chance to unwind over a mint tea. Marrakech promises romance and a touch of exoticism, but not everyone expects it to be so exhilirating! Its old souks, ancient and beautiful architecture, maze of streets and a whirlwind-like Medina experience like no other, qualify it for many a bucket list. Though if you're just looking for some winter sun you've also come to the right place. Either way, after your adventures getting lost amongst the colours and smells and crowds and dust you'll welcome some time being pampered in one of Marrakech's traditional hammams, or Turkish baths. Fez, the old, and ancient capital, overwhelms the senses with its colour, noise and cacophony of smells. The medieval Medina of Fez, with its 90,000 streets and alleyways, is partly covered so you get some respite from the sun, but none from the spitting camels, menagerie of animals, and the entrepreneurial spirit of vendors. Pick through the nicknacks and you will find hidden treasures here - but remember that haggling is a way of life. Or just eat your fill from a wonderfully enticing spread of street food. Head to the madrases if you need respite. The tanneries and dying pits of Fez are also a fascinating place to visit, and of course this city has some of he world's most treasured Arabic architecture. Essaouira spreads along a long sandy strip of Morocco's Atlantic coast, the kind of place you'd imagine Peter O'Toole's Laurence of Arabia riding in to off the desert. Definitely Moroccan, but with a European familiarity. What wouldn't work for the filmic Laurence is the backdrop swooping with windsurfers and kitesurfers. It's these active travellers who've helped protect Essaouira's natural charms from becoming over touristy. Today the busy medina is just as important as a market place as it ever was. This port is not just a pretty museum to a past life, it's still vibrant. If you want the desert you might consider Ouarzazate, a quiet town at the base of the High Atlas mountains in Saharan Morocco, for a long time a waypoint for traders between Africa and Europe. 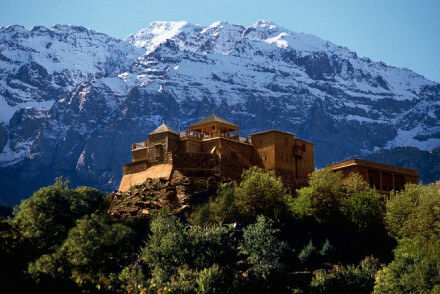 But if you want to see our experience something of Morocco's Berber culture you'll need to journey into the High Atlas. Aït-Benhaddou, with its mud brick buildings is one of the best known of the tiny Berber villages which cling to these mountains - probably because of its World Heritage Status. Amizmiz is another well known town, this time it's probably because it has one of the largest Berber souks in the area. If you've come to Morocco for adventure you'll also want the High Atlas mountains. Jebel Toubkal is probably the tallest of them: it's both one of the highest mountains in North Africa, and a very achievable summit - it can be done in two or three days. For the real thing when it comes to royal palaces, Mosaic Palais Aziza, just ten minutes from Marrakech's Medina, is owned by a Saudi prince, who lives opposite this romantic, secluded hotel. This is a place to relax - and despite the obvious luxury it's unfussy and peaceful. The pool is large enough, and has enough private pockets so that couples will feel like they're the only ones here. 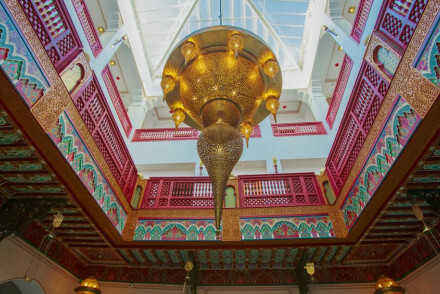 The Riad Kaiss has once a harem, so it's a great place to stay in if you're looking for somewhere with a bit of history to it! It's been very elegantly converted, but many of the most beautiful original features have been kept, including some gorgeous tiling and latticework. Dar Ahlam is a traditional Ouarzazate Kasbah, transformed into a luxury retreat. Sumptuous suites and private villas provide the comfortable sleeping arrangements, while the hammam and giant pool will help bring you back to life after time in the desert. Wow. In a Wow setting. 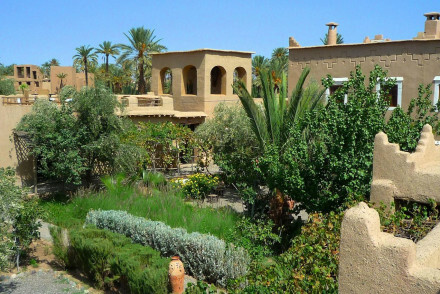 Traditional and comfortable, the Kasbah Bab Ourika is eco-friendly, with a Berber feel. Traditional 'rammed earth' walls surround rose-filled courtyards and there's a gorgeous terrace and pool. Plus there's plenty to do in the staggeringly beautiful surrounding countryside. And all this is only 45minutes from Marrakech. Fez's Medina is one of the few places on earth to Rival Marrakech's, and Riad Fes is a great place to stay to discover it. It's peaceful luxury will be a balm at the end of the day, as will the fantastic Moroccan cuisine, the pool and spa, and the views from the terrace. 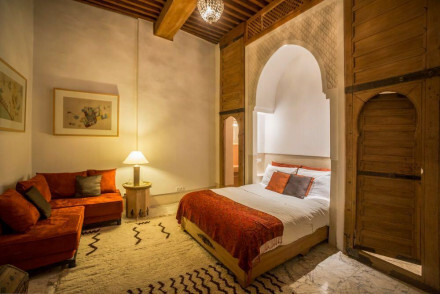 If you love the idea of staying in a riad, try Villa de l'O, an 18th Century boutique version, just minutes from the beach, souks and golf courses of Essaouira. As well as being a romantic blend of traditional and colonial decor, this villa has wonderful sea views from the rooftop terrace, which also overlooks the old town's battlements. Dar Liouba used to be an Imam's residence in Essaouira, and its seven comfortable, sunny, whitewashed rooms can all be booked together. On the outskirts of Marrakech you'll find Jnane Tamsna. Owned by the legendary Meryanne Loum-Martin, renowned for her style and hospitality, this luxurious collection of villas enclose 24 en suite bedrooms, plus numerous dining areas, sitting rooms and outdoor spaces. Add to this the nine acre gardens and five swimming pools and you’ve got the perfect foil to the busy medina. The Jardins d’Issil, where 15 caidal tents are set up around a huge infinity pool. Is unusual and fantastic value for money. 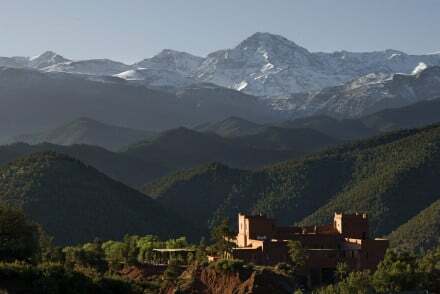 Located just outside Marrakech itself, the view of the Atlas Mountains are incredible and you can book B&B from as little as €30 per person per night. If you're here for the history book into Dar L'Oussia, which is situated in the old ramparts of Essaouira. As well as the historic location these 23 rooms, and fours suites, ooze heritage, from the four poster beds to the art, to the wonderful inside courtyards and romantic balconies overlooking them. 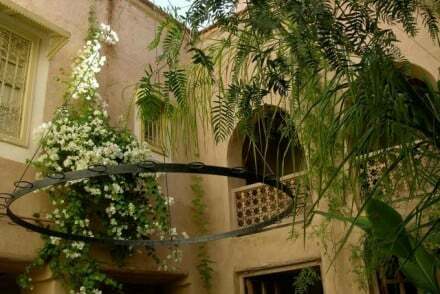 Dar Adrar is a simple guesthouse within the Toubkal National Park, but still only an hours drive from Marrakech. In a lovely little Berber village with spectacular views of the mountains, this is the kind of place where the hot water may not always come on demand, but the grand breakfasts and excellent tagines will make up for it. Riad al Bushra is a newcomer to Marrakech's riad scene. In the perfect location, in the heart of the Medina, it offers five suites, all excellent value for money, with prices starting at just €75 per night. 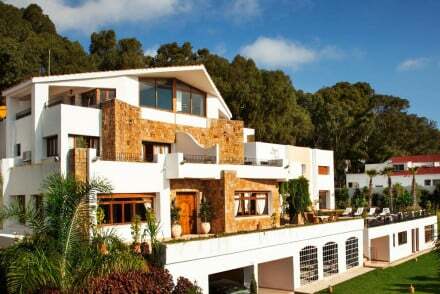 In 2012 Dar Les Cigognes won the accolade of Best Cooking School in Morocco - so it's foodie-friendly. Here you also get beautifully decorated rooms and stunning city views from the roof top terrace. Les Cinq Djellabas is an encampment of ten African eco lodges, offering the perfect spot to chill out away from the buzz of the medina. 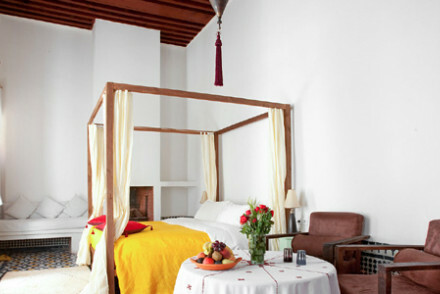 The feel is barefoot luxury - where contemporary minimalist design blends easily with traditional Moroccan craftsmanship. Ideal for groups but also extremely private. The Domaine de la Roseraie is a rural paradise in the foothills of the High Atlas. It's surrounded by wonderful trekking country, but it's also a great place to unwind. The altitude, 1000 meters above sea level, means it's cool in summer, and tucked away in a valley, it's also mild in winter. Gorgeous Berber castle, Kasbah Angour is the Moroccan equivalent of a country house hotel, with 25 rooms, two suites and a decent restaurant. The views over the High Atlas foothills are spectacular, there's a beautiful garden and a huge swimming pool. Still not sure which is the best place to stay in Morocco for you? 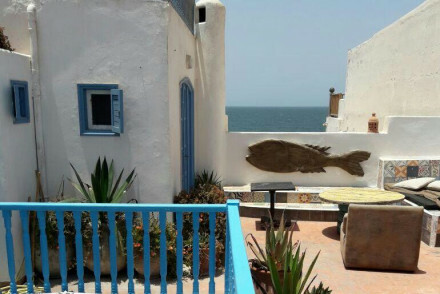 This colourful, characterful riad owned by a French artist will appeal to a younger crowd who appreciate a relaxed, informal atmosphere. Guests can dine at the proprietor's lively nearby restaurant. Great walks - Take a walk along Essaouira's lovely beach that extends down to where Bob Marley had a house. Local markets - Explore the bustling and hustling Essaouira souk. A lovely creamy clad guesthouse, formerly an Imam's residence. Sunny rooms have white washed walls, comfortable beds, and splashes of colour. Cosy living areas have fireplaces and there's a fabulous roof top terrace. Excellent value, available for exclusive use. Restrictions on children - Over 2s welcome. This old family house provides value for money considering the generously proportioned and elegantly decorated rooms, complete with four poster beds. 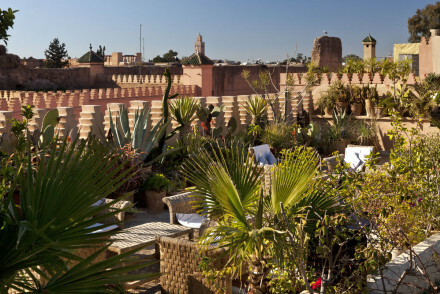 Located in Fez medina there is an inviting roof terrace from which to enjoy panoramic views. Breakfast is served with lunch and dinner on request. 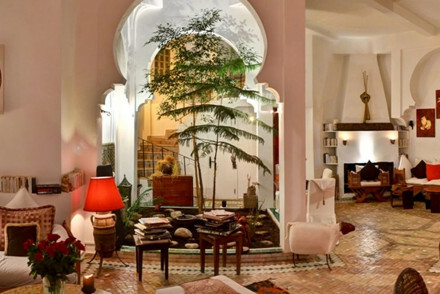 A lovingly restored riad in the heart of historic Fez. Rooms, situated around a pretty central courtyard, keep their traditional features yet have a chic contemporary feel with large glass windows and white washed walls. A stunning rooftop boasts spectacular city views. A tranquil city base. Local exploring - Perfectly situated in the heart of the ancient city of Fez. Sights nearby - Visit the Volubilis, an ancient city founded in 3rd century BC. Cooking classes - Take a class in the art of Moroccan cooking. Expect a warm welcome at this authentic medina haven. Rooms lead off from a lush pool courtyard with an array of exotic plants and lots of cosy nooks & convivial areas to relax in, while the restaurant offers delicious seasonal cuisine. Great value for a well-situated, elegant and friendly base! A tranquil and leafy haven, surrounded by an exquisite garden with a pool. Understated rooms, ideal for a calm retreat, with the town on your doorstep if you want to venture out to the souks. Breakfast included and other meals can also be prepared upon request. A simple yet pretty holiday idyll. In a modern complex in the residential Boubana quarter outside the main city, this guest house sits within its own manicured garden with a pool. Suitable for couples, business and groups. Groups - A small hotel offering a secluded spot on the outskirts of Tangier. Ideal for groups to take some or all of the property. Great walks - Wander through the cobbled residential and commercial alleyways of the Kasbah walls. Sights nearby - See The Grande Mosquée Of Tangier. Well located and easy to find in Petit Socco district just as you start the ascent towards the medina, this large traditional-style hotel, housed in a former bank is perfect for groups large or small. Local exploring - Ideally positioned in the historic centre with many of the main attractions within walking distance. 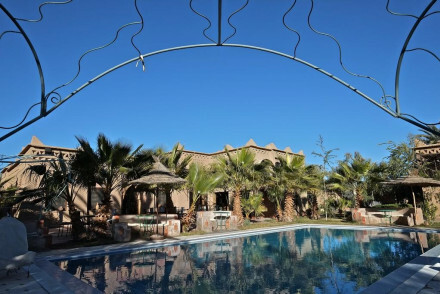 A charming guesthouse in a gloriously remote location set between the Sahara desert and Atlas mountains. Atmospheric rooms are traditional in style with warm pink walls, fireplaces and woven rugs. Featuring a spa and organic restaurant but it's the laid backed vibes that really make this one. Families - Family suites and plenty of outdoor activities make this ideal for a holiday with children. Back to Nature - Set in a unique landscape offering mountains and deserts, lakes and palm groves. Sights nearby - Walk to the impressive 17th-century Kasbah of Amerhidil. A peaceful oasis set in the foot-hills of the Atlas with sights nearby. A Berber dwelling conversion with elegant yet simple interiors and several comfortable lounge areas inside and out. Delicious home-cooked food and warm hospitality. A charming tranquil base.